For long, I had wanted to get some statistics on the number of blog posts I do per month and blog on blogs.arno.fi. For even longer, I had had abstinence symptoms from not doing almost any coding at all this century. Today, I combined the desire for statistics with the desire for some semi-coding and got some statistics done. And this is how I did it. Browsing through the other tables, they seem to be best left for browsing and editing through the user interface of WordPress itself. The tables on the blog level are named wp_1_blahbah, wp_2_blahblah, wp_3_blahblah and so on. I can't say that this is a better table design than merely entering blog_id as a further key in each of the tables, but hey, I'm a happy WordPress user and not out to redesign their database structure. Besides, they may well have solved some scaling issues by adding eight new tables for each new blog. However, the complexity of the database structure will affect my job of doing statistics. And looking at life from a positive standpoint, it will increase the amount of programming joy I get out of my desire to do relevant blogging statistics. There are, as said, eight tables for each blog. Let's pick my blog no 8, /isit/ (this very blog, "It's Some Interesting Topic"). The two most interesting ones here are wp_n_posts and wp_n_comments. The three tables named around "terms" are about tagging and automatically updated through WordPress. The wp_n_options (blog level options) and wp_n_links (blogrolls etc.) tables are relevant, but adequately browsable and editable through the WordPress user interface. The same goes for the field settings in wp_n_postmeta. post_date: Publishing date of the post. Crucial for statistics. Remember, you can backdate posts or write posts in advance. post_modified: Editing date of the post. This is when you last touched the post. post_type: This is usually "post", for normal, published blog posts. For what WordPress calls pages, it's "page". But there are also plenty of instances with "revision" (for intermediate versions of the blog post, if you save and edit it multiple times) and "attachment" for instance if you upload a .jpg file. Consequently, where post_type in ("page","post") becomes an essential part of many blog statistics SELECTs. comment_status: Either "closed" or "open" depending on whether comments are allowed or not. 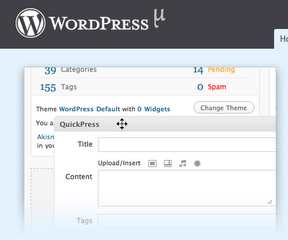 I have combatted spam by disallowing comments for particularly infested entries, using the normal WordPress UI. I could bulk reallow comments on all closed entries with a simple UPDATE on comment_status, once I've installed better spam prevention. guid: the complete URL to a post, such as http://blogs.arno.fi/isit/?p=211 (which then will be converted to http://blogs.arno.fi/isit/2009/03/16/a-digital-native-and-my-first-nokia/ by WordPress once you surf to it). post_name: contains the "a-digital-native-and-my-first-nokia" part of the URL (which is neatly editable from within the WordPress UI). However, what I'd really like to have is that very same piece of statistics, but for all my blogs in one report. I don't want to run eighteen reports, one for each blog. And that's where my coding desire can be satisfied. My idea is to create a new, aggregate table for statistics, where I insert one row for each blog entry in each of the eighteen blogs. I specifically mentioned 8 as blog_id and "/isit/" as path in order to later be able to separate blog entries by blog. Note the changes: "INSERT INTO", "4", "fib" and "wp_4_posts". Now I manually substitute the first INSERT INTO with a CREATE TABLE, and run the select-generated SELECTs. Finally, the statistics I desire! -> where post_date > "2007-12-31"
Mission accomplished! The statistics are there, and I had fun "coding" with MySQL. Photo Manager: How do you keep track of your pictures? If you're like me, you have tens if not hundreds of thousands of digital pictures. Tendency: Growing. How do you sort them? Archive them? Tag them? Find the right picture? Keep order in your backups? Personally, I have no good answer to the above questions. I am still looking for the right program -- ideally, Open Source Software that helps me keep track of my digital pictures. So if you have a good answer, please tell me! This blog entry is an attempt to define the specifications of what I need. I have labelled the software "FOSS Photo Manager", but I do understand it needs a catchier name. Basically, I'm fairly happy about my software for editing pictures. But not for managing my collection of pictures. 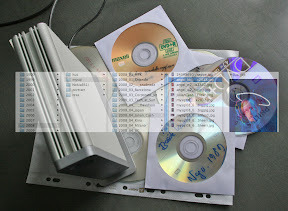 Perhaps I should call the dreamt-up software "Robfat" (for rename, order, backup, find, archive, tag), as I want to remove excess fat from my HDs (and CD/DVD cabinets). I need a lean, easily accessible collection of all my pictures. To identify likely siblings of a picture (edited versions, renamed versions -- based on similar file name, file size, date). To create statistics of my picture collection: How many pics do I have? By year, by tag, by various other criteria. Ideally (but this isn't a basic need), I would also like to keep track of where I've used which picture (photo books, phones, digiframes, printouts, screen savers, Picasa, Flickr, Facebook). Keep track only of pictures currently accessible. Nope! I want also the external HDs that aren't around, and the CDs/DVDs. Touch my pixels. Nope! Don't even turn the pics 90 degrees. All editing should be done with separate software. OK, so I'm happy if this software creates thumbnail copies (using ImageMagick or whatnot), if I clearly instruct it to. Do stuff not related to keeping track of my pictures. Nope, don't email pics. Don't synch them to the web. Don't print pictures. Don't import pictures from cameras or memory cards. Just keep order on my file system. Be an island like iPhoto. Nope. 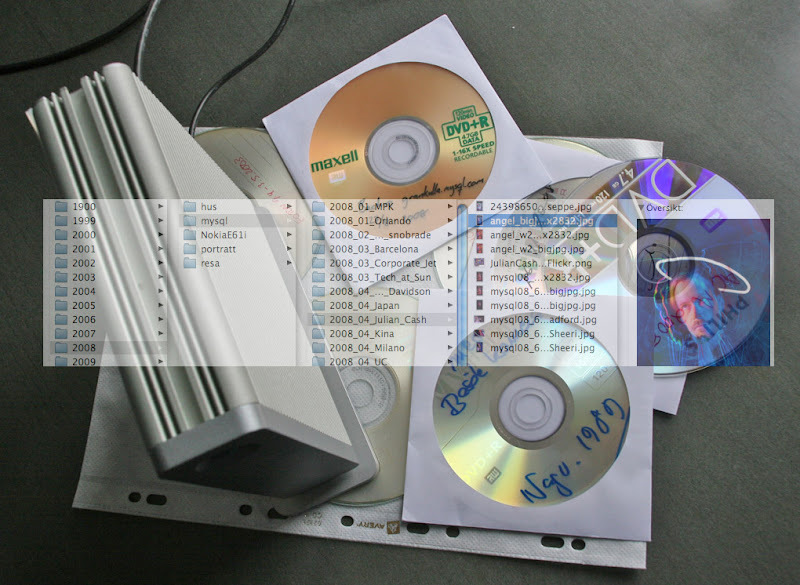 Everything this software does to create order (structures, tags, albums) should be visible outside the program, in the directory structure, in file names, in EXIF tags. Force repetitive tasks on the user. Nope. If all pics in a directory need a particular tag, then make it easy to tag them all. If normal workflow requires frequent hand movements between the keyboard and the mouse, then redesign it. So: No reinvention of the wheel -- but yes please, an invention of sensible traffic management that relieves me of queuing in the rush hour! Do you have tips for me? 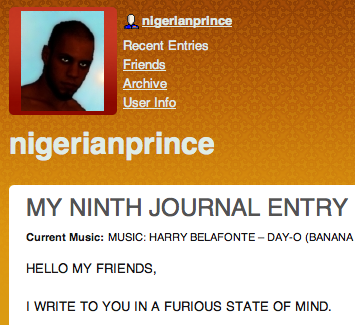 Through a recommendation by Peter Vesterbacka on Facebook, I popped into the interesting blog of WILLIAM JULIUS OGEDENGBE, a NIGERIAN PRINCE who is skilled at blogging in ALL CAPS. His posts, today NINE in total, are hilarious. They prompted me to retroblog something semi-Nigerian I wrote in January 2004, after a long working day for MySQL AB in Japan. You'll find it on my /kajsql/ blog. Retroblog, I hear you ask. What's that? By “retroblog” I mean a blog entry that is backdated to the date when it was actually written, albeit at that time not intended as a blog entry. So while in a sense this is a milder genre of creative historical revisionism, the only blatant lie is the backdating of the blog entry. The text itself isn't backdated. (Stalin would still likely be proud of me, had I ever been a Soviet citizen). Modification before hitting "Publish": Googling on "retroblogging" gave me 159 000 hits, so there is clearly prior art when it comes to defining the concept. What a shame. Still, "backdated blog without backdating text" is the only relevant part of my private little definition, anyway.